UPDATE: NIMA and Dawa Pelden have been successfully separated and are in a strong condition, thanks to the remarkable efforts of Royal Children's Hospital surgeons. 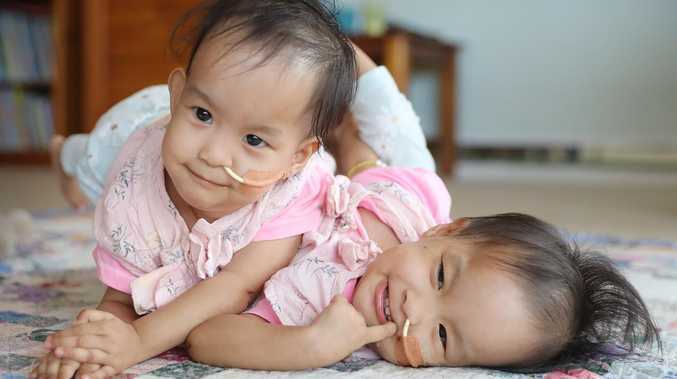 Just before 12.45pm - one year, three months and 27 days since they shocked Bhutanese doctors when they were born joined at the lower chest - the sisters were finally separated in the RCH's Theatre 6. By 2.30pm the team of more than 18 specialists had completed work to reconstruct the individual bodies for the 15-month-old Bhutanese sisters, signalling the start of their new lives. In a remarkable outcome Nima and Dawa have emerged so strong from their surgery that they are not expected to require intensive care and may instead be able to wake in separate beds for the first time later today. While the thoroughly planned separation process was expected to last into the late afternoon or evening, surgeons Dr Joe Crameri, Dr Tom Clarnette, Dr Liz McLeod and Dr Michael Nightingale were able to complete both the separation and reconstructing phases of the operations much sooner than expected. On hearing the news, Children First Foundation spokeswoman Julie Webber said all were thrilled the girls had been given a new beginning. "We are elated - so happy for mum, dad and siblings and everyone involved," Ms Webber said. Earlier today, their mother Bhumchu Zangmo said she was relieved when told surgery was just days away, but she was anxious at the thought of what lay ahead. She was overjoyed by a surprise delivery of more than 350 heartfelt messages of hope and support from children across Australia who had followed their story on kidsnews.com.au. "I am so happy that so many people have good feelings and prayers for my twins' surgery," Ms Zangmo said, speaking through a translator. "I will take all these letters to Bhutan and when the girls grow up and are able to read, I will ask them to read them all." Schoolchildren from every state urged the twins to be strong and brave and told them how courageous and beautiful they were, including Alana, 9, from Deer Park who wrote: "I have been through eight surgeries before. It was scary for me because I didn't know what life would be like. But don't worry, I'm right beside you," Alana wrote. Finn, 12, said he knew the girls were strong and would come out on top. "You are an inspiration to us and we should follow you with great pride and joy," he wrote. The separation surgery was originally planned to take place on October 12, but had to be postponed to allow the girls to build their strength and overcome ill health after the long journey from their Himalayan home. 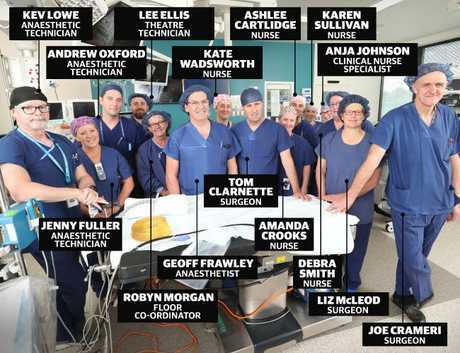 RCH head of paediatric surgery Joe Crameri on Wednesday announced a team of 18 surgeons and other specialists would work in unison in the operating theatre on Friday, while others would be involved in the unique effort required to care for the sisters after the operation. Dr Crameri said the plans for the surgery remained unchanged from the initial proposal, based on scans undertaken in Bhutan and in Nima and Dawa's first days in Australia. EARLIER: CONJOINED twins Nima and Dawa Pelden have been taken into an operating theatre as Royal Children's Hospital surgeons begin the long and complex procedures to separate them. The Bhutanese sisters, 15-months, are expected to undergo the gruelling surgery into the late afternoon or early evening. Speaking before the surgery this morning, RCH head of paediatric surgery Joe Crameri said the team was ready to go with strong plans in place, however the full extent of Nima and Dawa's condition remained a mystery. "We keep making guesses as to how long this will take. The reality is that until the operation starts and ultimately we get to see what is connecting the girls we won't really know how long," Dr Crameri said. "I hope we are not going to get any complications today. The challenges we face, and what we will be looking for, is simply what bits actually connect the two girls together. "We know from imaging the that liver we have to address and we feel confident with the team that we have we can address that in a safe manner. "The unknown is that we know bowel is mixed, and it could be entirely separate and just sitting next to each other. (But) it could also be that the girls share a bowel and we need to find a way of diving that, but leaving an adequate length for the girls." The 18-member surgical team of Royal Children's Hospital specialists will undertake a long, two-staged process to separate the twins. Having waited and prayed for this moment for so long, Nima and Dawa's mother Bhumchu Zangmo said she had mixed emotions. "It is very strange … I can't describe how I will feel when I see them," she said through a translator. "I have been used to taking care of them as one person, but I feel it will be better for them after the surgery because they can learn to start walking or doing whatever they want." 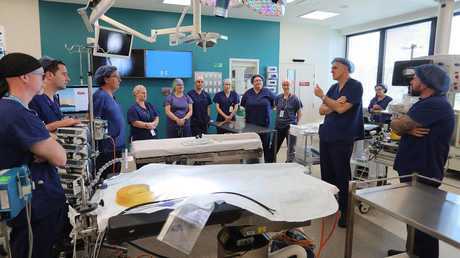 Almost the entire surgical team gathered yesterday in the RCH's Theatre 6 - the hospital's largest operating space - for a dress rehearsal of the procedure, aimed at finalising the most intricate details. The complex task of anaesthetising two matching girls at exactly the same time, who share an unknown level of circulation, will begin at 8.45am. It could take anywhere from one to two hours. Connected as a mirror image from the lower chest and through their abdomen, Nima and Dawa must be placed on their side during the first stage of surgery. The positioning makes it difficult for surgeons Joe Crameri, Tom Clarnette and Michael Nightingale, who are charged with separating the girls' shared liver, crossed over bowels and any other internal organs. During yesterday's rehearsal, the issues of what would happen when the girls were finally separated were debated, including fears the severed join will cause the girls to fall away from each other, risking connection to their life-maintaining anaesthetic machines and potentially compromising sterile drapings. "If we take the whole muscle off at the beginning they will literally roll apart," Dr Crameri said. "We will have to make a judgment, but I suspect keeping something bridging might be better until we know we are (no longer) dealing with the side so they don't fall away." Here is the huge Royal Children’s Hospital team tasked with the marathon task of saving Nima and Dawa Pelden through separation surgery. The groups' decision to keep a section of the twins joined will delay the moment when they are officially separated, but it overcomes a potential pitfall. When Nima and Dawa are finally separated, the RCH team can move to the second phase of process by separating Theatre 6 into two halves - Green and Red. To simplify the complexity of conducting two identical operations in the same room, everything in Theatre 6 - surgeons, nurses, anaesthetists, medical equipment and even little patients so identical their parents cannot tell them apart - have been assigned as either Green or Red to avoid mix ups. Once separated, Dawa will be taken to a different operating table and the sisters repositioned on their backs, then separated by a 2m gap declared off limits to everyone other than four surgeons. In the Green half of the theatre surgeon Liz McLeod will join Dr Crameri operating on Nima, while Dr Clarnette and Dr Nightingale will lead the Red efforts to reconstruct Dawa. As the most critical juncture of the process, with the greatest risk to the sterile environment and repreparing the girls, the team yesterday decided they would completely stop and rescrub into the theatre to start afresh while liver surgery equipment was swapped for reconstructive tools. 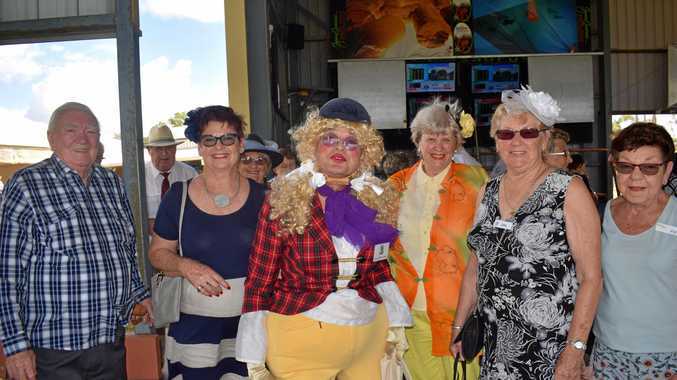 "We will have to declare at that time, when Tom (Dr Clarnette) is there and says 'we are ready, we are stable'," Dr Crameri said. "That is when we literally step back, we take the gear off, and we almost go back to the start of the operation again. "It just makes more sense to do that. We can step back and give (anaesthetists) Ian and Geoff time to get settled and move the kids across. "Once we are moving them it is more about reconstruction, not about the liver. The bowel we can separate and do on different tables." With so many people having to be present in the same operation at once, "closed theatre" signs have already been printed for the doors to keep all non-essential staff well clear. As discussions turned to who could stand where and when, nurse Amanda Crooks was given authority to dictate movements within the theatre. "We are at max, we are packed," she said. 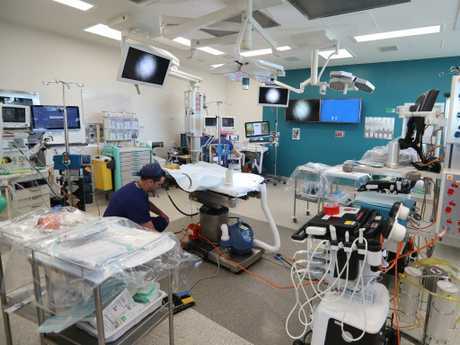 But in an effort to train other surgeons the operation will be live streamed into the RCH's media room so staff can watch remotely. As sisters subject to the same operation, Nima and Dawa were originally to be admitted to hospital with similar patient identification numbers, known as Unit Record numbers. But with the twins already having the exact same appearance, their 'UR' numbers have now been changed to "very different" digits to avoid the potential for a mix up when they finally emerge from theatre, which is expected to happen this evening. Overwhelmed not only by the enormity of the surgery but the efforts of Children First Foundation to make it possible, Ms Zangmo wanted to thank all Australians for her daughters' chance at healthy, separated lives. "I want to say thank you to everyone for bringing the twins and me from Bhutan, and all the efforts to take care of us, feed us and clothe us," she said. "I am so happy and looking forward to the surgery."